It was September of 1966, and the girls were too excited to sleep, concentrate on their homework, play in the yard or even watch their weekly shows. They hadn’t seen him in over six months. 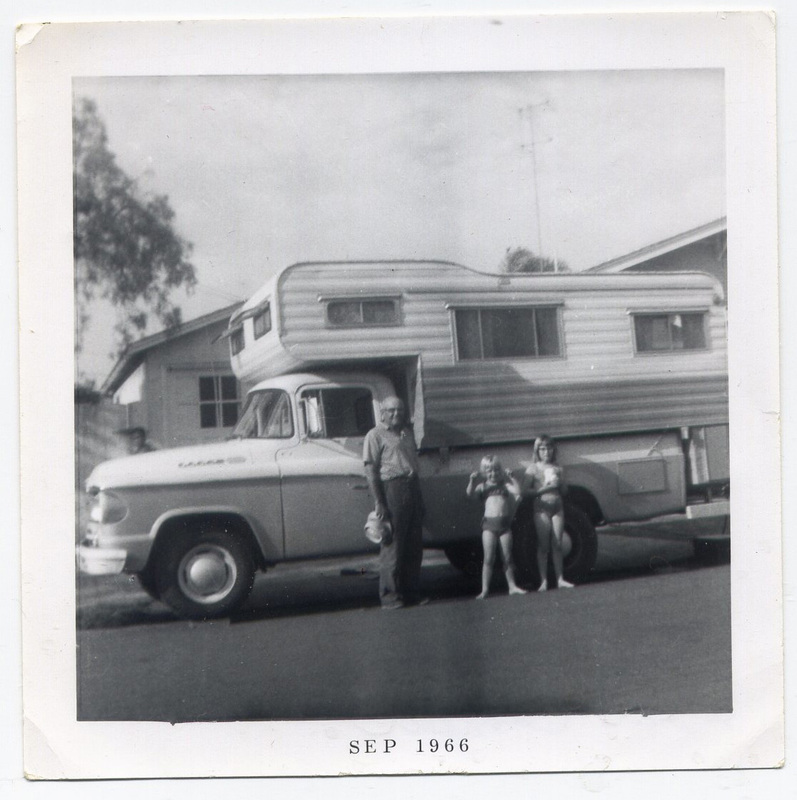 He’d bought the camper after mother passed and had been seeing the world ever since, fulfilling her dream of wandering the country trying to see all of the best places. National landmarks? No. Famous museums? Nope. Skyscrapers, cities, overlooks, natural wonders? I only wish. She wanted to see all of the sideshows. As a little girl, her father had a business venture out in the middle of nowhere, and due to reasons never fully explained to me, there was one time that he had to bring a young version of my mother with him. On the way home, he was particularly exuberant due to such a successful meeting that, in his good mood, he detoured at a sign that said, “Come see the world’s largest frying pan.” And that’s when she caught the bug. I always thought it was about the rare moment she shared alone with her father. Her mother never really left her father’s side, which is why I’ve always been curious as to the events that lead them to this trip without her. But she always told me it was about the sheer size of it, the fathoming of how a job that large could even have been completed. The pan was the size of a house, she’d said. Anyway, she spent so many years talking about traveling cross-country to see these monuments to human wastefulness, but they’d only seen about seven or eight; father was all about the history of our great country, not oversized objects. So he started this adventure and spent a chunk of their savings on a camper to see as many of them as possible, I think out of guilt. So now, my girls, who love their grandpa very much, who have spent the last half of a year missing him, are excited at the prospect of his arrival. Every car that drives down the street calls them to the window. “Is it him?” I would ask. “Nope,” Linda would say with a dejected look on her face. “Uh-uh,” Nancy would respond, slumping back onto the couch. “You know, girls, he may not even get here today. He’s driving a lot, there’s traffic, accidents, and he’s old, he needs to sleep and rest sometimes.” They hated hearing this. It was the next day when he finally showed up, and the girls were distracted by a new board game I’d set out for them. It was the loud bang of the camper’s old engine that made them jump up and run to the window. “He’s here!” Nancy shouted as she ran to the door, Linda’s little legs trying to keep up with her big sister. As he put them down they blushed and then became shy. Oh no. A slide show. My parents had been putting us through those for years, and they were one thing I didn’t miss. And to think those were shots of historical landmarks and beautiful, picturesque landscapes. The last thing I wanted to see was a photograph of the world’s largest artichoke. The girls ran around a bit and as they tired themselves out I approached. The girls got excited and started smiling as he rooted through the bag. Stephen, at the head of the table, was the first recipient. “Okay for my favorite son-in-law, a t-shirt!” It was a shirt that had a drawing of a man leaning against an artichoke that was almost his size, and it said “I Got Choked Up at the World’s Largest Artichoke, Castroville, CA” and he smiled. “Wow, thanks Bill,” he said, barely containing a laugh. “And for my special little granddaughters, I got you these!” They were two stuffed strawberries. “World’s largest strawberry?” I asked. We assembled in the living room on the couch as he doused the lights and turned on the projector. It started with a shot made from a titling set we bought him before he left. “World’s Largest” it said. “Clever title, Bill,” my husband stated dryly. And thus started a cavalcade. A stuffed steer that almost reached the ceiling. A statue of a sharptail grouse (I didn’t even know what one was until then) that he’d driven all the way to Canada to see. A doorknob (I’m not kidding). A dog dish (again, not a joke). A shot of a penny with Lincoln’s head larger than my father. A potato. Yes, a potato. Followed by a huge pierogi statue on a fork. The shots went on and on until about an hour later, when we were finally saved by that giant white light of emptiness in the slide cartridge. Stephen and I clapped, the girls snored. The next morning as I served breakfast he had a surprising announcement. “Oh I’m sure whatever you need we have here, dad,” I responded. I looked at the girls, who both teared up. After breakfast he brought his already-packed bag down and had his camera. I didn’t want him to finish so I hugged him again. Stephen came up and shook his hand. They came out and posed with him in front of the camper as I took the shot. They looked a bit sad to see him go so soon, this man whom they adored. “Drive safe,” Stephen said to him. “Always,” he said, gave me one last hug, then picked up each of the girls and giving them a kiss. He pulled himself up into the driver’s seat with some difficulty, shut the door, started the engine and then rolled down the window. He smiled a huge smile, waved and drove off.